It has now been 0 days since Java Bean broke a glass. 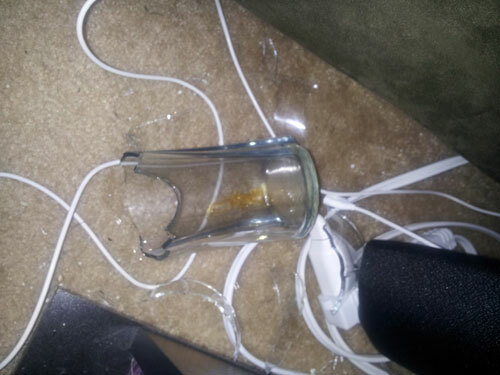 I found pieces on the couch as well as the floor, so I’m not sure what trajectory the glass took as it fell of the table. All I know is that I just vacuumed the couch extra well. Cat in a box! Cat in a box! Well, there goes the party I was planning for the two-year anniversary. Bad Java Bean, bad cat. Dawww!! Well maybe his next streak will be longer. . .it was good while it lasted. I am surprised the streak went on so long. I am gad my Shadow doesn’t have that proclivity, but when I kept my son’s cat, Shasha, she most certainly did. I am really she is back with them! Hope the counter gets into high numbers again! Aww! I was recently thinking that the counter might be defunct, since it had been SO long! How did it break on carpet? @Natalie – I’m not completely sure, but I think it got knocked onto the couch, rolled off and then slammed into the side of the table. That, or it landed right on the hard, rectangular part of the extension cord on the floor. Aw. If that’s a vase rather than a drinking glass, could he at least get off on a technicality? @Dana – No, it’s a glass. The Anchor Flair set from Bed, Bath and Beyond: http://www.bedbathandbeyond.com/product.asp?SKU=14585338 However, I just read some reviews on that page and people are saying these glasses break really easily. So maybe this whole thing has been entrapment and I didn’t know it! The cat might be ready for college, looks like it took massive calculations to execute that wicked break. I wish i could even get to 100 days with Ms. Cleo — she has at least trained me to USUALLY remember not to leave any glassware on the counter or coffee table — I am pretty sure she intentionally knocks them down to hear the sound of something breaking.